There you are, deadline fast approaching, the screen blank, and so it your head. You look around the room, maybe pace a bit, read a few pages in a magazine and try to avoid getting too deep into any Web browsing. A fresh idea just isn’t popping into your head! In that past, a few items would come in the mail that could help. They were little books of inspirational things famous people said. Then, there was that funny app on the Palm that was a little cartoon Dilbert. He would say a random generated bunch of words that almost always made sense and could get a new direction kicked off. Of course, the creator of the Dilbert software never got permission to use the likeness of Dilbert so the software went away. A couple weeks ago, a coworker made a comment, “off to Inspiro to get started”. We all chuckled as if we knew the place. We were later surprised to learn it’s a iPad app. An app, like our old Palm Dilbert, that came up with catchy words groups to get the mind pulses started. The universal app, Inspiro, has a variety of backgrounds to choose from. It has thousands of words that is works through and presents through a minimalist interface so that it is only you and the words. Inspiro does allow you to add your own words if there is a particular direction you want the inspiration to go. While Inspiro presents the words grouped so that they can be a bit nonsensical, they are still close enough to get a person thinking about what it could mean or how it ties to something else. It’s all about clearing the head and getting the fingers typing. 1. THE MUSE is a kaleidoscopic amalgam of basic word-forms such as Adjectives, Adverbs, Nouns, and Verbs strung together in interesting and unexpected ways. With the ability to add your favorite words to the vocabulary list and the push of a virtual button your mind will be flooded with thought provoking, bizarre, and often comedic phrases. Be prepared! 2. SCENARIOS focuses on characters and their situational interactions. This chapter is excellent for acting exercises, comedic improvisations, or playing a game of charades. Directors can find the perfect plot points for their next film. Painters and illustrators can find the subject of their next piece. No matter how you utilize this chapter you will never run out of original scenarios to incorporate into your projects. 3. 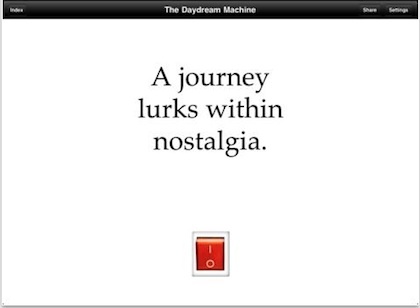 THE DAYDREAM MACHINE is conceptual phrase randomization on autopilot — meditation and intellectual stimulation all at once. Just sit back and enjoy the show. As it automatically meanders in thought and you ponder some of these concepts, you may feel the need to pause & discuss with other people. You may find yourself debating the questions put forth, or arguing against a controversial statement. In a group situation, The Daydream Machine is a great conversation starter. Use it to initiate discussions, friendly debates or collective projects.